The place online to find outdoor condensing units for air-source heat pump systems. Standard to high efficiency split-system heat pumps and condenser compressors. Heat pump outdoor, split-system, air-source condensers online. Amana:Looking for a solution to keep your home warm in the cold winter months? Take your pick from Amana's line of premium heat pumps to enjoy lasting comfort. Ameristar:Heat Pumps – Ameristar Heating and Cooling | Ameristar heat pumps: Budget-friendly heating and cooling for milder climates. Arcoaire:Heat Pumps | Arcoaire offers Heat Pump products. Learn about the features and benefits of the Heat Pump and find a dealer nearby. Broan HVAC:At Broan, we offer a wide-variety of heat pump, heating and cooling systems. Click here to explore our range of high-quality heating and cooling heat pumps. Carrier:Carrier split system heat pumps are a smart alternative to an air conditioner, offering heating, cooling, dehumidifying, and more. Daikin:Quiet. Energy Efficient. Daikin heat pumps are a wonder of design. With the ability to both heat and cool, a heat pump system is an excellent choice in home comfort. Evergreen Energy:Heat pump condensers play an important role in the refrigerant cycle. Once heat is brought into your home, the condenser ensures the heat gets to where it's needed. But what exactly is a heat pump condenser? How does it work, and what should I do if it breaks? Find out with our in-depth guide to heat pump condensers. | Editor's note: Nice energy website about heat pumps. Gemaire:Shop For Residential Heat Pump Condensers At The Nation's Top HVAC Distributor - GEMAIRE in the Residential Condensers category. Goodman:Looking for information on Goodman brand Heat Pumps? Learn more about Goodman Manufacturing Heat Pumps and other quality HVAC systems today! Heil:Heil offers Heat Pump products. Learn about the features and benefits of the Heat Pump and find a dealer nearby. Lennox:Keeping cool is easy when you rely on a Lennox air conditioner. Review our wide selection of air conditioners, sure to meet your residential application needs. Maytag:Heat Pumps | Heat Pump System | Maytag HVAC | If you're in the market for a new air-source heat pump system turn to Maytag HVAC. Explore the wide range of heat pumps from ultra-efficient to budget-friendly. Mitsubishi Electric:Keep a single room comfortable year round with an efficient single-zone cooling and heating solution. National Air Warehouse:Shop condensers with evaporator coils at National Air Warehouse. Top brands such as Rheem and Goodman. Shop with confidence - BBB A+ Rating. Norbord:Heat Pump and Air Conditioner Condenser Locations Matter | Some installers believe that placing these systems in a garage or attic space may make the system more efficient by decreasing the difference in temperature. But it’s precisely because of these disparate temperatures that you should place your heat pump and air conditioner condenser outside. | Editor's note: Good article on the placement of outdoor heat pumps and air conditioners. Payne:Payne offers dependable, affordable and energy efficient, residential heat pumps, heating and cooling, efficient HVAC systems. Rheem:Rheem has the most comprehensive, feature-loaded heat pump lineup in the heating industry. Our super-efficient technology provides savings on both gas and electricity. Trane:Save on a premium heat pump, contact a local Trane dealer today. Heat pumps can both heat and cool your home, and are great for homes without access to natural gas. In colder weather, it is normal for a heat pump condenser to run longer. A heat pump system works on the principle of a lower temperature at a higher volume of air. A heat pump condenser is just the reverse cycle of an air conditioner. In air conditioning systems, indoor heat is "absorbed" through the flow of refrigerant and expelled outside. In a heat pump system, it's just the opposite. 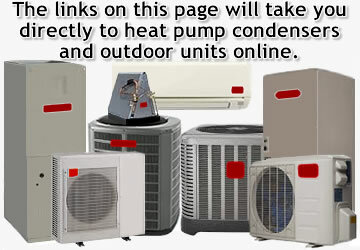 This reference page has an index that will guide you directly to heat pump outdoor condensing units online. This web page focuses on heat pump compressors and systems. On extremely hot or cold days expect your heat pump system to run longer. A longer running heat pump condenser actually saves on energy because it uses more electricity to start than to run. It also allows the indoor-electric, heaters to stage according to the outdoor temperatures and the thermostat's set point.